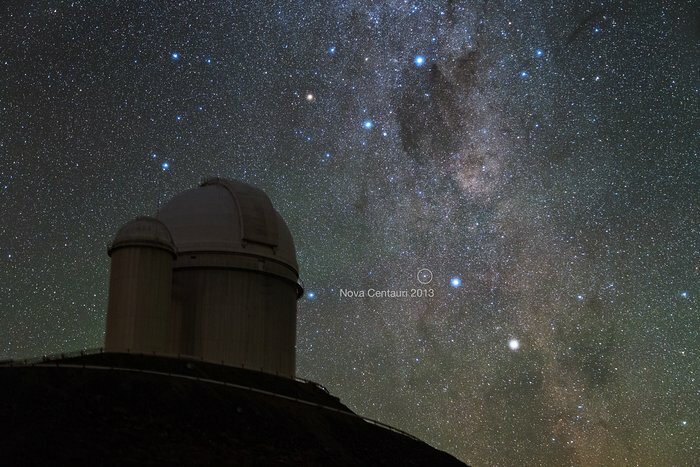 Alpha and Beta Centauri, two of the brightest stars in the southern sky, had a new companion in late 2013 — the naked eye Nova Centauri 2013. This photo was taken by ESO Photo Ambassador Yuri Beletsky at ESO's La Silla Observatory in the Chilean Atacama Desert in the morning hours of Monday 9 December 2013. The nova was discovered by John Seach from Australia on 2 December 2013 as it approached naked eye brightness. Nova Centaurus 2013 is the brightest nova to have occurred so far this millennium. This particular event is known as a classical nova, and is not to be confused with a supernova. Classical novae occur in binary star systems when hydrogen gas from the orbiting stellar partner is accreted onto the surface of the main star, causing a runaway thermonuclear event resulting in the brightening of the main star. In a classical novae the main star is not destroyed as is the case in a supernova. Instead, the star is dramatically brightened, and there is a simultaneous expansion of a debris shell. The nova appears in the picture just to the left of Beta Centauri, the bluer and higher of the two bright stars in the lower-right part of the image. The Southern Cross and the Coal Sack Nebula are also captured near the top of the picture. In front at the left is the ESO 3.6-metre telescope, inaugurated in 1976, it currently operates with the HARPS spectrograph, the most prolific exoplanet hunting machine in the world. Located 600 km north of Santiago, at 2400 m altitude in the outskirts of the Chilean Atacama Desert, La Silla was first ESO site in Chile and the largest observatory of its time.